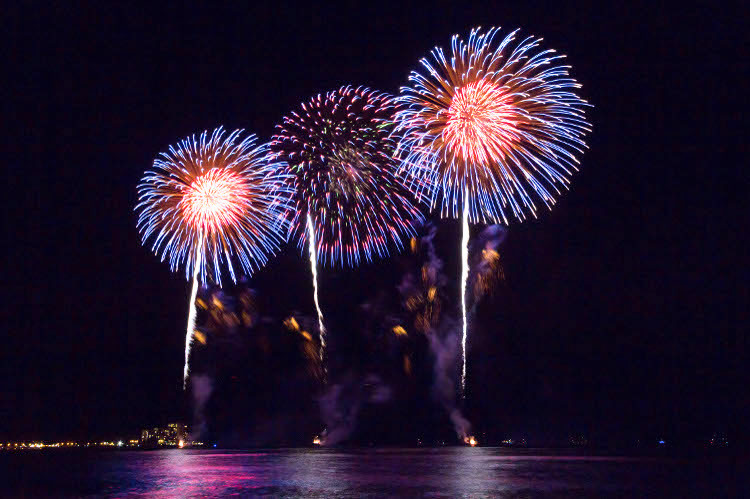 The Nagaoka Fireworks was the finale for the Honolulu Festival, which is highly anticipated by many every year. This day was a bit chilly evening in Hawaii. The spectators from the Grand Parade headed toward Waikiki Beach to watch the fireworks. They waited 30 minutes before the show with a great anticipation. Some enjoyed the view by the shoreline and some looked up at the sky. Also, some of the audience were gathered around and waited outside the lanai of a guest room near the beach. The show started at 8:30 P.M. The fireworks have launched with a loud sound and the ray of lights reflected in the sky. It began with a single shot of white color fireworks with a message of prayer for peace. It fired three times as a commemoration to the war causalities of the U.S. and Japan with thoughts of lasting peace that establish good relation between them. 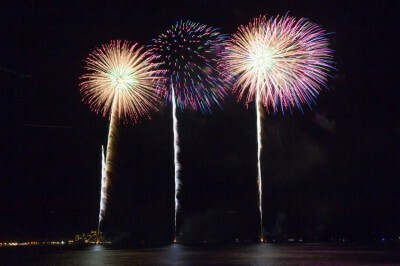 There was a great floral fireworks bloomed in the night sky over Waikiki. The fireworks were launched steadily from barges on Waikiki Beach. Also, many of the spectators were using their earphones to listen to the radio. The FM radio station called the “Hawaiian105 KINE” was in charge of broadcasting the event. 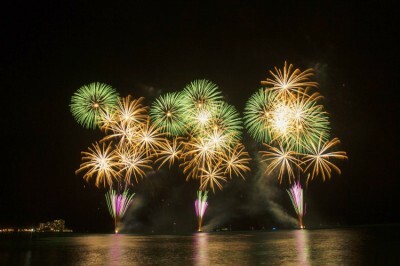 It tells about the background and the message of each firework that was launched into the sky. The background music blended beautifully which made one’s experience more impressive and memorable. Furthermore, the star mine fireworks titled The Bonds of Friendship between the U.S. and Japan was launched with the Hawaiian state song called Hawaiʻi Ponoʻī which was also a national anthem during the Kingdom of Hawaii. In addition, its red and gold symbolizes the color of the outfits of the Royal Family, which were selected to commemorate King Kamehameha the Great. Another star mine fireworks called Phoneix was launched into the sky with a promise to take a leap forward from the Niigata Chuetsu Earthquake which occurred a decade ago. They are Nagaoka’s symbol for “recovery” in hoping for Niigata. The spectators enjoyed the fireworks along with the song called Jupitar by Ayaka Hirahara. 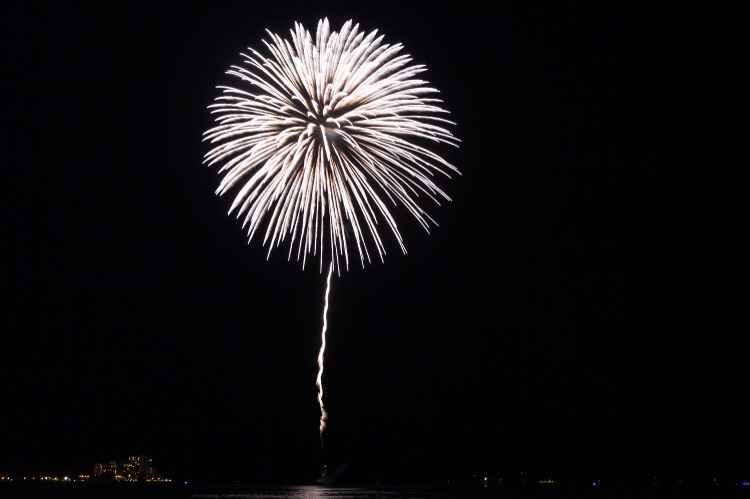 Also, the fireworks called HAWAII FIVE-O bloomed magnificently along with the theme from its TV series. The fireworks set off from 3 different locations by various intervals and sizes. The big sized fireworks were the main show. Also, the fireworks called Shidare-yanagi entertained the spectators with numerous random shots which are loved by the people of Nagaoka. The show reached its climax! Also, the fireworks called Ten-Chi-Jin was the finale. Its name came from the title of the historical Japanese drama, which the story takes place in Nagaoka. It is one of the popular Japanese dramas in Hawaii. Furthermore, the fireworks set off with the epic theme from the original drama which created a luxurious atmosphere. 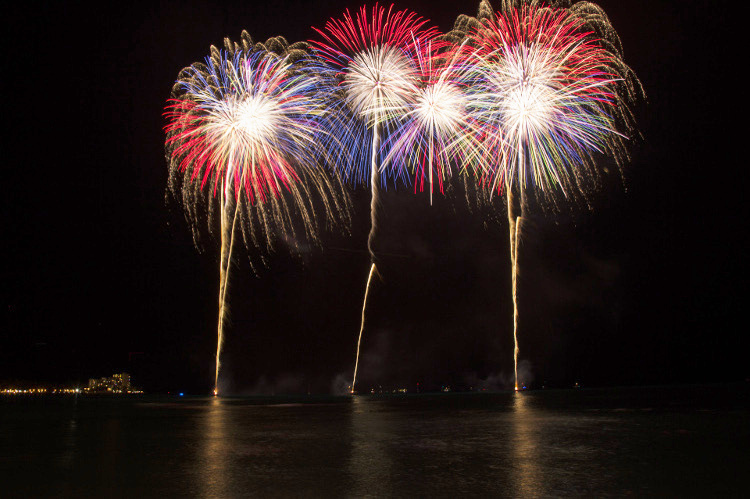 The colors of the fireworks brightened the sky of Waikiki in full bloom for about 15 minutes. 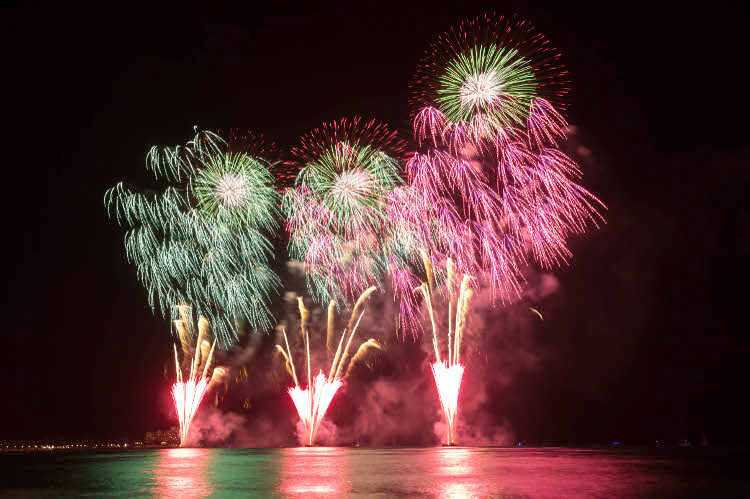 This year’s Nagaoka Fireworks was successful which brought many smiles and excitement. The audience exchanged dialogues to each other in satisfaction as they were leaving the scene. They looked anticipated for the next year! 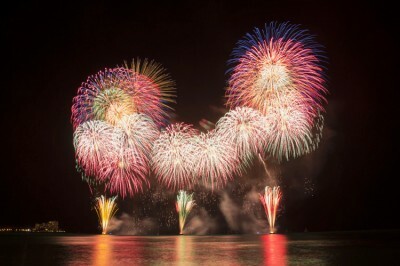 The themes of Nagoka Fireworks were “Memorial”, “Recovery” and “World Peace”. We hope that the viewers were able to grasp them as they watched such spectacular show of the fireworks. Furthermore, this year mark the 70th anniversary of the end of World World II. The peace ceremony between Honolulu and Nagoka City will be held as a commemoration on August 14 and August 15 at Pearl Harbor. 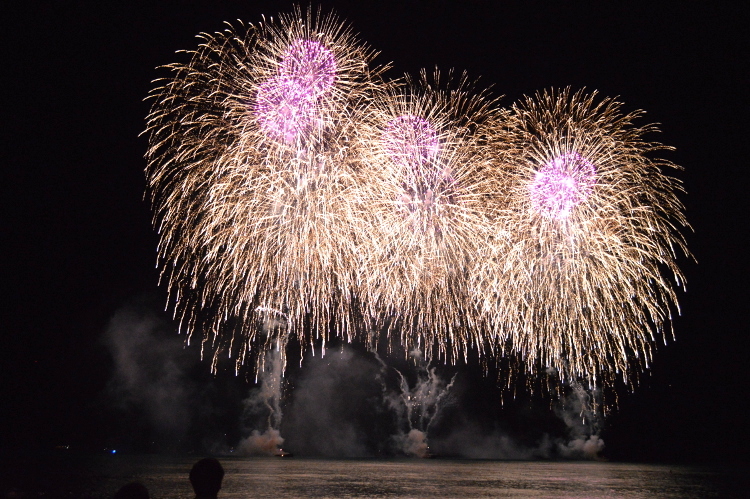 In fact, the Nagaoka Fireworks will be launched one again for the finale. It is true that everybody wishes for peace. 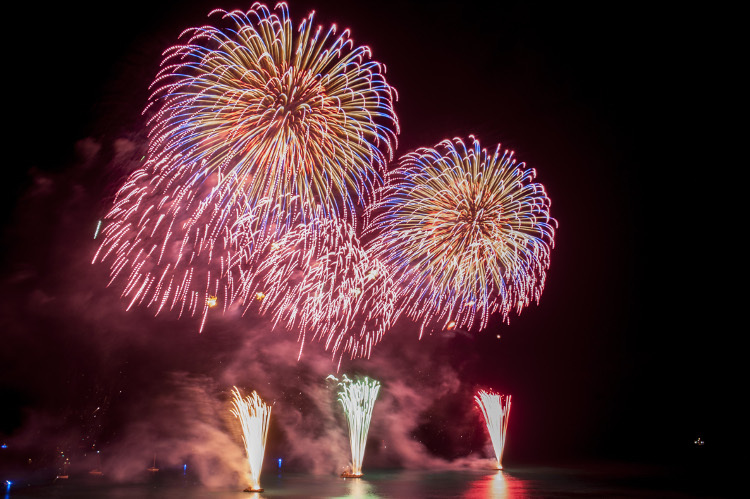 The Nagaoka Fireworks continues to inspire others regardless of one’s race, ethnicity and generation.